Animation:Master FAQ - How to change the Default Interpolation of a bone or some property? In the PWS, select the channels you want to change the default interpolation for. If the desired channels don't exist yet, you must create them. In other words, there must be at least one keyframe for each property you want to change. Option A: Good for changing a large number of channels.With all the channels selected, switch to Channel View in the Timeline.Click once in the Timeline and hit [Ctrl-A] to select everything.Right-click inside the yellow selection box (if each channel has only one keyframe on frame 0, the selection box will be very narrow).And choose Curve > Interpolation Method ... and choose a default interpolation method.Then, double-click inside the yellow selection box. A Channel CP Settings dialog box will open. 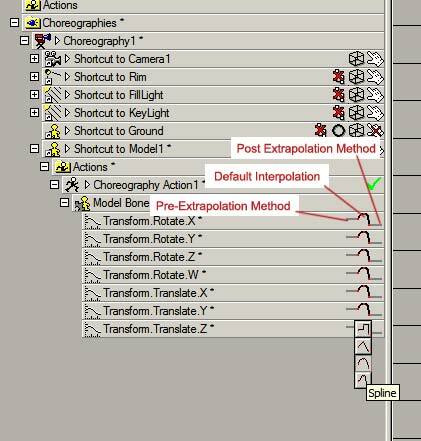 Make sure the value for "Interpolation Method" is set to "Default". (Sometimes it is blank, or is set to something else). Option B: Good for changing only a few channels.In the PWS, under the Choreography you are working in, locate the channel(s) for which you want to change the default interpolation.To the right of the channel(s) are three icons that look like they are connected. Usually they are a straight line, followed by a curved line, followed by another straight line (see the picture). The middle icon (the curved line) is the default interpolation method. Click on it and some new options will pop up.Select the option you want.